In my 1,978 attempt to will Austin to have an Autumn, I decided to make a crisp on this abnormally cool day. 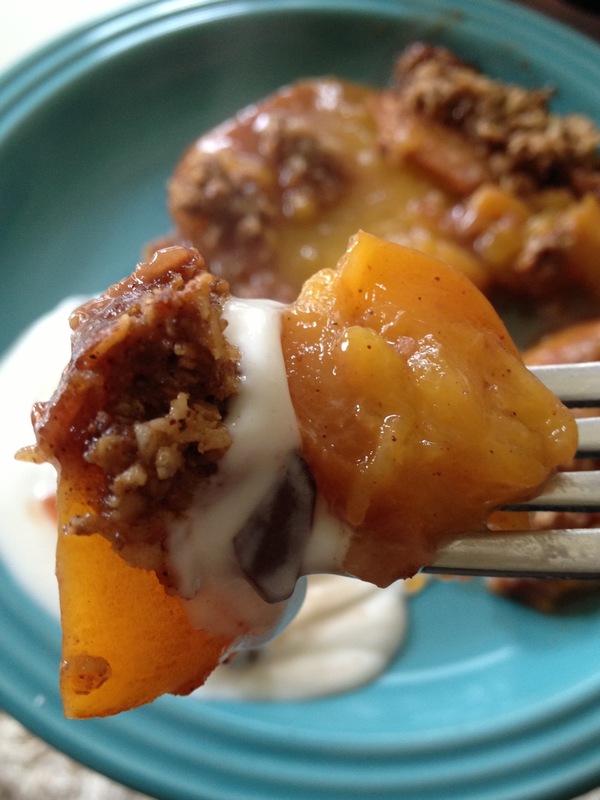 I’m bored with the expected and somewhat plain sweetness that comes with a peach or apple crisp, however, and really wanted to try to make a light version. 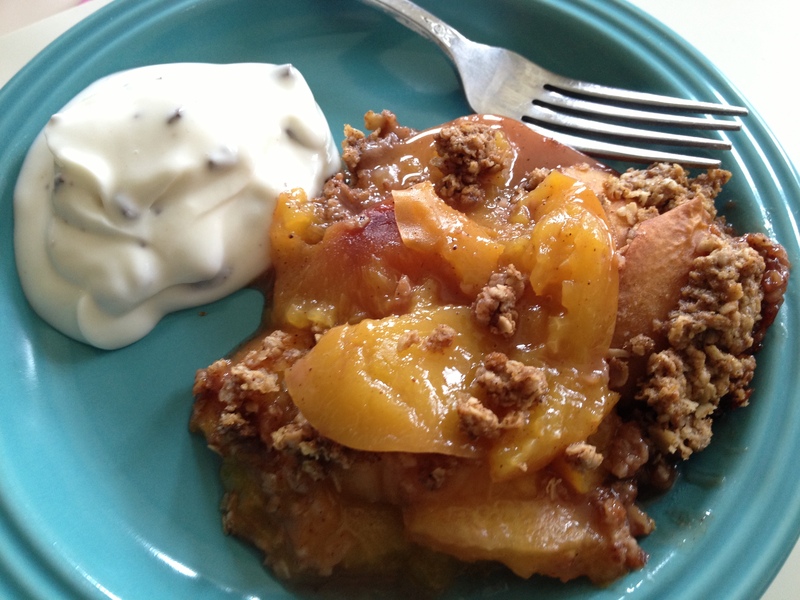 With the entire 8 X 8 inch pan containing only 3 tablespoons of butter and 1.5 tablespoons of brown sugar for “bad” fat and sweetness, I had to ramp of my peach crisp’s flavor in terms of spices. And the whole reason I made this a peach crisp was because I was too lazy to go out and get apples. Preheat your oven to 375. Spray an 8″ x 8″ with nonstick cooking spray. Layout a single layer of peach slices; it’s fine if the edges over lap. Lightly sprinkle about a teaspoon of flour, 1/4 teaspoon salt, and 1/2 teaspoon of pumpkin spice over this layer. They shouldn’t be completely or evenly covered, just a scattered sprinkling will do. Add another 2 layers of peach slices. My peaches made roughly 3 layers, filling in holes here and there where needed. You don’t want to merely stack the slices on top of each other, but you should stagger them, making sure there are no gaps. On the top layer, sprinkle another teaspoon of flour and 1/4 teaspoon of salt. In a bowl, combine the oats, butter, brown sugar, ginger, pepper, nutmeg, vanilla, and remaining flour and pumpkin pie spice. I found the best way to do this was with my fingers, mashing everything together until everything had formed small clumps. Sprinkle these clumps as evenly as possible over the top of the layered peach slices. Bake the crisp on the center rack for 25 minutes. After 25 minutes in the oven, drizzle the 3 tablespoons of red wine over the top of the peaches. This will mingle with the peach juices, flour, and spices making a fantastic syrupy sauce by the time it’s through cooking. Continue baking an additional 15-20 minutes or until the peaches are tender and the juices are bubbling around the edges. 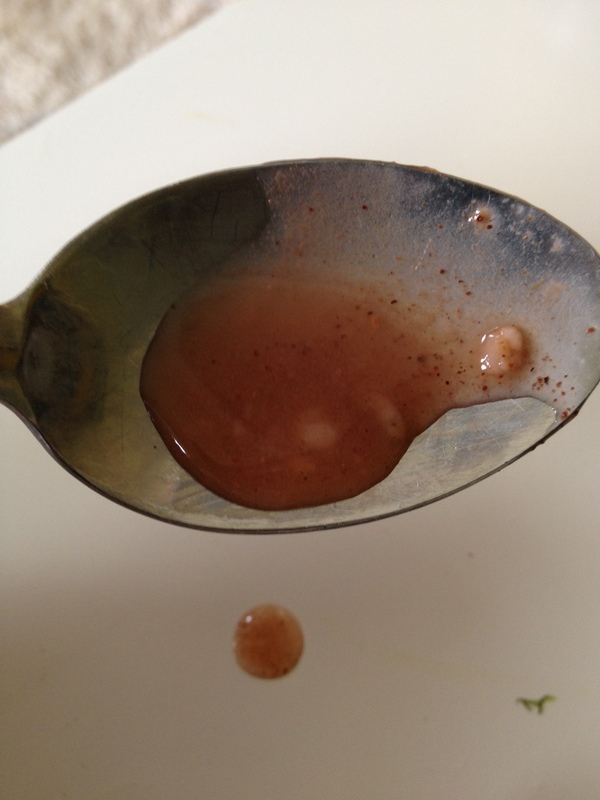 Let the crisp cool on the counter for 10-15 minutes; this will thicken the sauce as well. With only 372 calories and 27 grams of fat from the brown sugar and butter in the entire pan, this winds up being a very guilt-free dessert. This means, divided into 6 large servings, it’s only 62 calories and 4.5 grams of fat from added sugar and butter! And those are big servings. You can easily get away with doing 8 servings to save even more. Yes, you can make this with sugar substitutes if need be, but as I am not diabetic, I’d rather eat the small amount of sugar and save myself from the chemicals and sodium of artificial sweeteners. In lieu of ice cream, I served my crisp with a dollop of Chiobani Vanilla Chocolate Chip Greek Yogurt. The flavor of the wine had become delicate, but a nice noticeable addition to the usual plainly sweet crisp, and you can see all the spices in the golden syrup that it creates. The best thing about this very flavorful dessert, is that you don’t feel the need to run on a treadmill or brush the excess sugar of your teeth right after eating it. Perfect for Fall, and a great ending to a dinner party – or even as an afternoon snack of comfort food! This entry was posted in Entertainment, Food, Geek Chef, Recipes and tagged Apple, autumn, crisp, dessert, diabetic, diet, fall, healthy, light, low fat, peach, pie.